Darina Allen Ballymoe Cookery School, Ireland For over thirty years I've grown, cooked, experimented with, and been excited by fresh herbs, yet I found this meticulously researched book fresh and inspirational. Jerry Traunfeld's flavor combinations and beautifully written prose are irresistible. Jasper White author of Lobster at Home I am amazed by the scope of this book! First, it is a great cookbook, full of beautifully conceived ideas and recipes that teach the subtleties of cooking with fresh herbs. 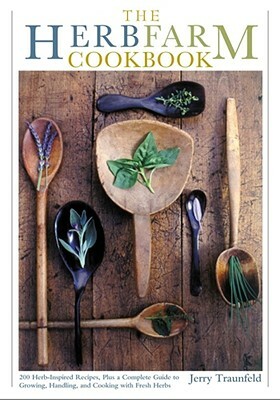 Second, The Herbfarm Cookbook is a valuable reference, with helpful charts, line drawings, and botanical illustrations. An outstanding book! James Peterson author of Sauces and Vegetables How do I use herbs? Which herbs go with what? How do I know which to combine? These, the most asked of all kitchen queries, are answered with clear reasoning and sound intuition in Jerry Traunfeld's The Herbfarm Cookbook. Jerry Traunfeld's simple and honest recipes burst with flavor and will have you rushing to the kitchen to cook and to the garden or window box to plant. Sylvia Thompson author of The Kitchen Garden and The Kitchen Garden Cookbook A brilliant work, brimful of invaluable know-how and astonishing combinations of flavors. Jerry Traunfeld's book has become an instant favorite in my kitchen and my garden. Marion Cunningham author of The Fannie Farmer Cookbook The Herbfarm Cookbook belongs on your bookshelf. Remarkable and original in the use of herbs, this is not only a collection of sparkling recipes, it is also the best herb reference book I've ever seen. Dan Hinkley Heronswood Nursery, Kingston, Washington As I read through the pages of this book, I was transfixed by the text and style -- it is rare that one can come across such books that are born from pure passion and translate such excitement and erudition to the reader. I found myself immersed in the undistilled passion of the craft that Jerry has perfected. Emelie Tolley author of Herbs: Gardens, Decorations, and Recipes Anyone interested in herbs or cooking will be delighted by this superb collection of inventive recipes that range from Baked Mussels Stuffed with Mint Pesto to Black Pansy Sorbet. The information on growing herbs and basic herbal cooking techniques is a bonus.